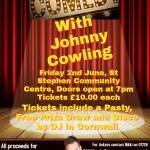 We are please to announce we have organised a night filled with fun and laughter with Johnny Cowling, there will also be a disco hosted by DJ in Cornwall. Purple Day Comes to Truro!! We are now getting everything prepared for this years annual Purple Day, only this year we will be bringing our Purpleness to Truro!! The date is Saturday 8th July and will be held on Lemon Quay in Truro. We will update the line up once all confirmed.